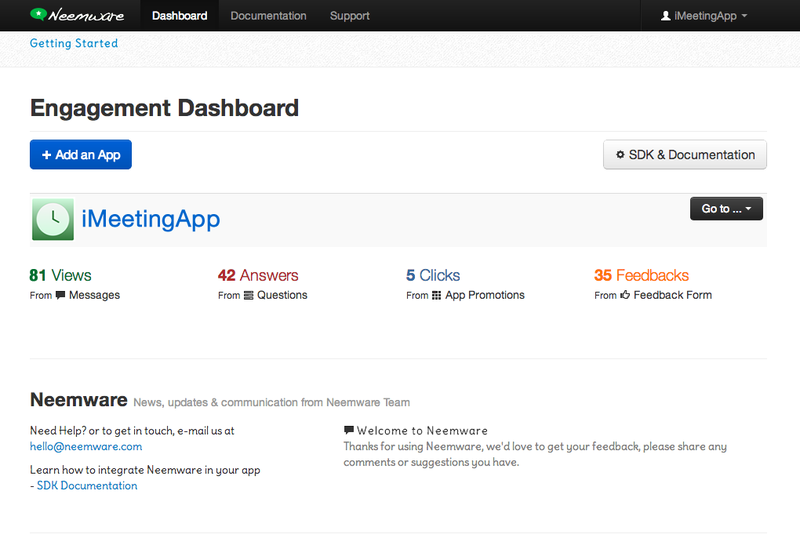 Neemware is a newly launched mobile marketing platform for mobile developers which allows the integration of messaging, feedback forms, questions, alerts, promotions, and more, into mobile applications. You can think of it as something like an Urban Airship for marketing. The platform, now available as a beta SDK, gives app developers a more personal connection to their apps’ users, but it also lets them segment their audience in order to better communicate with – or even reward – their most active users. Neemware co-founder Mads Srinivasan says he was inspired to create the company because of his own experiences using mobile apps. “I found that there was no way for me as a user to directly interact with the app owner,” he explains. His co-founder Prince Arora, experienced the same problem from the other side – as a UX guy, he didn’t have a good way to collect feedback from users. Often, mobile developers looking to better understand their app’s user base turn to old-school methods: email surveys, website Q&A’s, and they spend a lot of time reading their app store reviews. In terms of mobile SDKs for feedback and communication, there are limited options. Appsfire’s Appbooster and Appboy are probably the best-known competitors in terms of alternatives to what Neemware is launching, but Srinivasan believes his platform offers an improved workflow for an app’s users. “I would consider ours non-intrusive,” he says, “the mobile app is the hero, and you don’t want to disturb the user. You don’t want to bombard them with your ‘give me feedback‘ push messages…ours is very lightweight in that sense.” In Neemware, a banner ad appears and slides up slowly. Users are given a chance to interact with it, but if they don’t, then the banner hides and the messages from the developer appear as a badge instead. The messages never take over the user’s screen, and banners never stay in front of a user that isn’t interested in engaging. However, for users who do want to communicate with the app developer, they have the opportunity to do so. Neemware supports rich media messages which contain not only text but also photos or videos, for example. A developer could use this channel to cross-promote another app or offer a preview of upcoming features, among other things. They can also solicit feedback – even replying to users’ complaints with a note that says “thanks” or one that lets the user know that the bug is being fixed in a later release. Neemware’s Q&A system also allows for both free-form responses and multiple choice. And developers can offer coupons or incentives to encourage in-app purchases from first-time users or repeat purchases from regulars. On the backend, developers have access to a dashboard which lets them see which messages have been seen and clicked on, and allows targeting of an app’s users by time of day, location, or segment. Now in beta, the platform is being made available for free, and the freemium pricing here ($25/per app+) is not yet set in stone. The two co-founders are based in Cambridge and the Bay Area, but one will relocate to the other’s home base soon. The startup is mostly bootstrapped alongside some small angel investments, and is being advised by Nolan Wright, CTO and co-founder at Appcelerator, Rohit Sharma, CEO of Syfto, and Tom Duterme, advisor at Innovation Endeavors. Interested developers can now sign up here.